The ISO27k standards are deliberately risk-aligned, meaning that organizations are encouraged to assess risks to their information (called “information security risks” in the ISO27k standards, but in reality they are simply information risks) as a prelude to treating them in various ways. Dealing with the most significant information risks first makes sense from the practical implementation and management perspectives. It cites ISO/IEC 27000 as a normative (essential) standard, and mentions ISO/IEC 27001, ISO/IEC 27002 and ISO 31000 in the content. NIST standards are referenced in the bibliography. At 66 pages, ISO/IEC 27005 is a substantial standard although around two-thirds is comprised of annexes with examples and additional information. 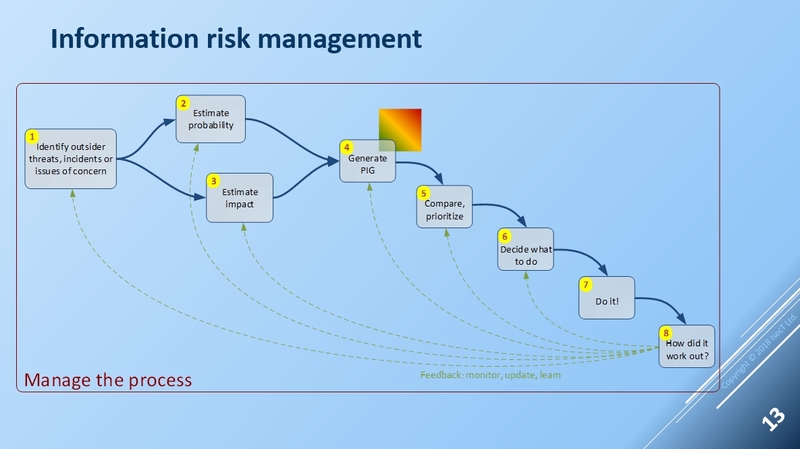 Monitor and review risks, risk treatments, obligations and criteria on an ongoing basis, identifying and responding appropriately to significant changes. Extensive appendices provide additional information, primarily examples to demonstrate the recommended approach. The third edition of ISO/IEC 27005 was published in July 2018. This is a “minor revision”, a temporary stop-gap measure with very limited changes - the main one being that references to ISO/IEC 27001 now cite the 2013 edition). A project to revise/rewrite the standard made insufficient progress and was cancelled ... and then re-started. Development of the fourth edition of ‘27005 is under way. Hopefully, the fourth edition of ISO/IEC 27005 will be published at about the same time as the next release of ISO/IEC 27001, supporting the updated ISMS specification. Read more about selecting suitable information risk analysis methods and management tools in the ISO27k FAQ. Hoorah! The standard has been updated, albeit 3 years late and almost unchanged from the previous edition. The updated introduction says it is “based on the asset, threat and vulnerability risk identification method [per ISO/IEC 27001:2005] that is no longer required by ISO/IEC 27001[:2013]”, lamely noting that “There are some other methods that can be used.” It goes on to state that the standard “does not contain direct guidance on the implementation of the ISMS requirements given in ISO/IEC 27001” [presumably meaning clause 6.1] and the standard “supports the general concepts specified in ISO/IEC 27001 and is designed to assist the satisfactory implementation of information security based on a risk management approach”, so make of that ambiguity what you will. The draft fourth edition’s working title “Guidance on managing information security risks and opportunities” gives a strong hint that it will directly support section 6.1 of ISO/IEC 27001:2013 (“Actions to address risks and opportunities”), mostly concerning the risks in fact: whether ‘opportunities’ and ISO 31000 get much of a look-in remains to be seen. Regarding ISO/IEC 27001 section 6.1, I believe JTC1 intended that section to have addressed risks to and opportunities for the management system, not for information or even information security, a crucial distinction. If that’s true, and if the fourth edition of 27005 explicitly supports 6.1, then logically it ought to concern the management of risks and opportunities to the ISMS, not to information. However, the 6.1 boilerplate wording imposed by JTC1 on all the management systems standards is ambiguous. Talking of opportunities, rewriting 27005 presents a golden opportunity for SC 27 to reframe it as a standard on information risk management where ‘information risk’ might be defined along the lines of “risk pertaining to information”. Among other things, that would remove references to ‘information security risk’, a curiosity of the current standards. What is that, exactly? It is not explicitly defined as a term. A note to the definition of risk in ISO/IEC 27000 refers to it as the “effect of uncertainty on information security objectives”. A note to the definition of objective says, rather enigmatically, “information security objectives are set by the organization, consistent with the information security policy, to achieve specific results.” So, stitching those two together, information security risk is defined as “the effect of uncertainty on information security objectives set by the organization, consistent with the information security policy, to achieve specific results”. Frankly I’m none the wiser, if anything more confused by the tortuous and unhelpful explanation.